Srila Gopal Bhatta Goswami appeared in 1500 AD (though, according to some authorities, he was born in 1503) as the son of Venkata Bhatta in the town of Srirangam in South India. Their residence was in a village not far from Srirangam called Belagundi. According to Narahari in the Bhakti-ratnakara, Srila Gopal Bhatta Goswami was given a vision in a dream by Mahaprabhu in which he was fortunate enough to witness all the Lord’s Nabadwip pastimes. 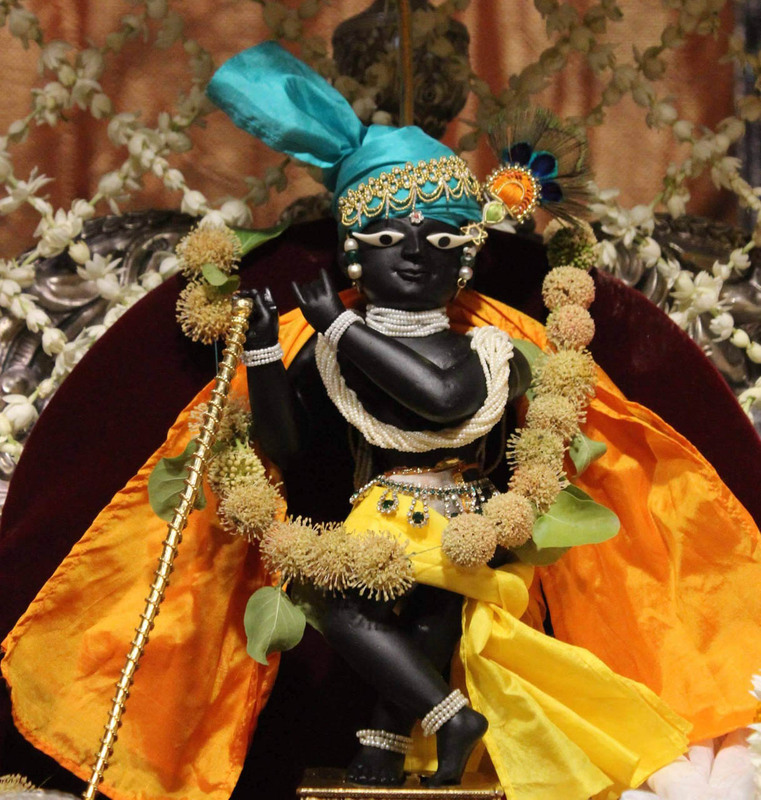 An eternal associate of Krishna, he appeared in a faraway place in order to participate in Lord Gauranga’s pastimes. Even so, he was able to know long before he even saw him that the Lord had appeared and taken sannyas. Gopal Bhatta did not particularly like the Lord’s appearance as a sannyasi. He was distressed and crying alone when the Lord appeared to him and gave him the dream vision of his Nabadwip lila. In this vision, the Lord was overwhelmed by ecstatic love, embraced him and drenched him in his tears. When Gopal arrived in Vrindavan, Rupa and Sanatan wrote to Mahaprabhu to tell him. The Lord was overjoyed and immediately wrote back telling them to affectionately take care of him as though he were their own younger brother. Srila Sanatan Goswami compiled the Hari-bhakti-vilasa and published it in Srila Gopal Bhatta Goswami’s name. Rupa Goswami considered Gopal to be as dear to him as his own life and engaged him in the deity worship of Radha Ramana. Srila Gopal Bhatta Goswami became one of the Six Goswamis, but he always kept an attitude of meekness and humility. Thus, when Krishnadas Kaviraj approached him for permission to write the Chaitanya Charitamrita, he granted it, but under the condition that he not write about him. Krishnadas Kaviraj Goswami could not go against the order of Gopal Bhatta and thus did nothing more than mention his name. Sri Jiva Goswami writes in the introduction to the Sat-sandarbha that he wrote it on the basis of an earlier text by Gopal Bhatta. Srila Gopal Bhatta Goswami also wrote a book called the Sat-kriya-sara-dipika (“Light on the essential sacraments for the Vaishnavas”). Thus his contribution to Gaudiya Vaishnava literature was in editing the Hari-bhakti-vilasa, preparing the notes for Jiva’s Sat-sandarbha and in compiling the Sat-kriya-sara-dipika. He also gave great joy to the community of devotees by writing a commentary on Bilvamangala’s Krishna-karnamrta. Amongst his disciples were Srinivas Acharya and Sri Gopinath Pujari. It is said that Mahaprabhu had such affection for Gopal Bhatta that he sent him his own belt and kaupina as well as a wooden seat which he had used. These items are still worshiped in the Radha Ramana temple by the current sevaits. When Srila Gopal Bhatta Goswami was visiting the pilgrimage centres of northern India, he found a Salagrama Sila on the banks of the Gandaki River. He took the worshipable stone and carried it with him wherever he went, treating it as Vrajendranandana Krishna himself. One day he thought that he would like to worship the Lord in a deity form so that he could expand his service. On the very next day, he found that the Salagrama Sila had transformed itself into Radha Ramana to fulfill the wish of his devotee. This deity stands alone without any form of Radha standing by his side. Instead, as a symbol of Radharani, a silver crown is placed on his left side. The story is also told in the following way. 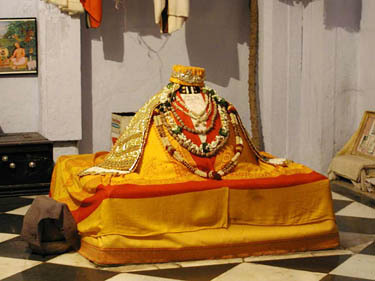 It is said that Srila Gopal Bhatta Goswami used to daily worship twelve Salagramas. He developed a desire to serve the Lord in the form of a deity, thinking that in this way he would be able to worship him in a much better way. The Lord within his heart knew his feelings and through a rich merchant had many beautiful items used in the worship of the deity, such as ornaments and clothes, sent to him. Gopal began to worry that all these beautiful objects would be wasted because there was no way that he could use them unless he had a deity in human form. That night, he put the Salagramas to rest and in the morning he saw that one of them had been transformed into the Radha Ramana deity. When Rupa and Sanatan heard that Krishna had so mercifully appeared to Gopal Bhatta, they immediately came with the other devotees for darshan, and when they saw him, they were ecstatic with love. The annual festival commemorating Radha Ramana’s appearance, when he is bathed publicly, takes place on the full moon day of Vaishakh. The Radha Ramana temple is considered one of the most important in Vrindavan. Srila Gopal Bhatta Goswami ended his earthly pastimes on the Krsna Pancami of Asarh of 1507 of the Saka era (1585 AD). His samadhi temple is behind the current Radha Ramana temple. By reading Srinivas Acharya’s hymn to the Six Goswamis, Sad-gosvamy-astaka, we can understand their glories.